Memorial Day honors the men and women who died while serving in the United States military. To observe this holiday, Americans hold family gatherings and barbecues and participate in memorial celebrations and parades. Here’s how you can celebrate Memorial Day weekend in Wichita. Memorial Day can be considered the unofficial start of summer – the kids are out of school, grown-ups are ready for a three-day weekend away from work and everyone is itching to get outside and enjoy the early summer sun. In Wichita, the best way to spend your Memorial Day weekend is with family and friends – and a few pounds of smoked or grilled meat. Next door to The Anchor, Wichita’s favorite neighborhood bar, is Wichita’s favorite neighborhood chop shop – of meat, that is. The Douglas Avenue Chop Shop carries premium cuts of beef, pork and even rabbit, including Creekstone Premium Black Angus Beef, Rare Hare Barn Rabbits and Good Shepherd Poultry. Shane Gross, owner of The Anchor, opened the butcher shop next door in 2014 to provide Wichita and her popular restaurant and bar with high-quality cuts of meat sourced in Kansas. The “Perfect Burger Blend” is ground fresh in-house and ready for your Memorial Day get-together. But don’t stop shopping at the butcher counter! The Douglas Avenue Chop Shop also carries a selection of artisanal cheeses and cheese service ware. Pick up a few ears of corn, bundles of summer-fresh asparagus and as many tomatoes as you have burgers at one of Wichita’s local farmer’s markets, and your cookout menu will be complete. What you’re cooking matters, but so does what you’re cooking with. All Things Barbecue is Wichita’s largest outdoor cooking equipment and supplies retailer. While you might not leave with a Kansas-made Yoder Smoker, you can find the finest smoking woods, delicious sauces and spicy rubs available in Wichita to make your Memorial Day weekend cookout a flavorful success. Of course, you don’t have to do all the cooking yourself. Most Wichita barbeque joints cater holidays and parties, including local favorites Bite Me BBQ, Delano Barbeque Co. and B&C Barbeque. Find the best barbeque in Wichita. Depending on the size of your guest list, a backyard cookout might not be in the cards. Luckily, Wichita is home to beautiful and spacious parks perfect for get-togethers with family and friends. Sedgwick County Park features several shelters – open and enclosed – and charcoal grills for rent. While the burgers are on the grill, family and friends can enjoy the park’s fishing docks, playgrounds and courts. Find the best park for your Memorial Day weekend. Putting a Memorial Day barbeque together might not be in your party plans. Luckily, Wichita-area attractions and restaurants have a weekend full of celebration and entertainment planned. Patriot Nations: Native Americans in our Nation’s Armed Forces opened at the Mid-America All-Indian Center. Armed Forces Day, May 20, and exhibits through Sept. 16. The banner exhibition showcases the history of the American Indian and Alaska Native men and women who served in the United States military dating back to the Revolutionary War. The exhibit is free, but museum admission applies for other exhibits. Military members and their family members may visit the museum free as part of the Blue Star Museum program. Other Blue Star Museums in Wichita include Botanica Wichita, Great Plains Nature Center, the Wichita Art Museum and the Wichita-Sedgwick County Historical Museum. Military members and their immediate family can also enjoy a 25 percent discount in admission to Tanganyika Wildlife Park with valid proof of ID now through Monday, May 29. Hopping Gnome Brewing Company celebrates its second anniversary this Memorial Day weekend with events Friday, Saturday and Sunday, including Anniversary Saturday at the Gnome starting at noon May 27 and Sunday Potluck at the Gnome starting at noon May 28. 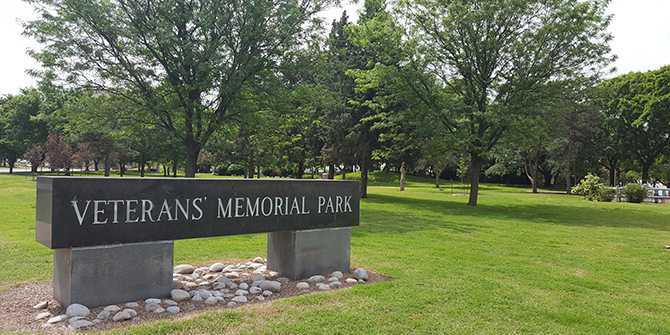 On Monday, May 29, the Delano Wind Ensemble, part of the Delano Chamber Players, will perform a patriotic concert in honor of Memorial Day at Botanica Wichita 2-3 p.m.
After the concert, head over to Veterans Memorial Park, where a recent installment of a World War II memorial will be celebrated at 3 p.m., Sunday, May 28. Learn more about the celebration. Then, get together with your friends at Barleycorn’s for the Whiskey Tasting Club’s May tasting at 4-9 p.m. Featuring five whiskeys made in the United States, Canada, Ireland, Scotland and Japan. Admission is $10 in advance, $15 at the door. Whiskey and snacks are included in the price. End your Memorial Day enjoying an American pastime – and a hotdog cooked on someone else’s grill – this Memorial Day with the Wichita Wingnuts. The ‘Nuts start a four-game series against the Salina Stockade at 7:05 p.m. Monday, May 29, at Lawrence-Dumont Stadium.